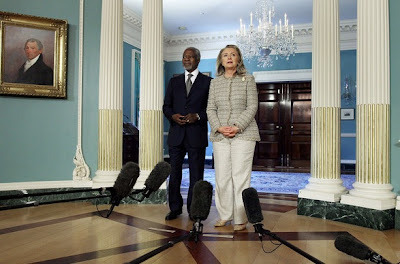 This is a brief video from the U.S. State Department Press Conference featuring U.S. Secretary of State, Hillary Clinton and former U.N. Secretary General, Kofi Annan. At the beginning of the video, both Secretary Clinton and Annan adopt a fig leaf (aka genital guarding) configuration with their hands. Hillary's is more out of respect for Annan, and while Kofi to a degree is probably mirroring her - a greater component of his fig leaf is out of a reaction to anxiety (and very interestingly anger .... What are his anger tells? Hint: One is a Partial Emblematic Slip and another is a microexpression). Neither should be using this body language here. They are both highly regarded senior statespeople and they should recognize the importance of projecting more authority, confidence and assertiveness than the fig leaf nonverbal transmits. Note how Kofi Annan looks around with both his eyes and his head. Despite his many years of experience, this is his reaction to anxiety. Experienced and confident speakers/leaders in any setting have more controlled and slower movements. This situation in Syria is growing worse by the day, so it is understandable why anyone in his position would feel anxiety. 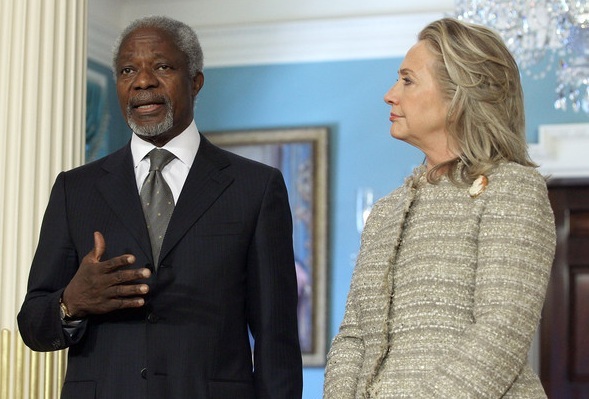 Note Annan stutters/mispronounces when acknowledging Secretary Clinton by name. In particular, while wanting to make eye contact with most/all audience members - and thus making everyone feel as if you're talking specifically to them and build much greater rapport - it is much better to look at a specific person in the eyes for three to four seconds - rather than a continuous sweeping and/or jerking movement as Annan is doing. After this brief time of this individual eye contact (but not too long lest they feel a predatory intent) - then in a random fashion do the same with another person in a different part of the audience. In relatively small audiences it is usually possible to accomplish this with nearly everyone. In larger audiences, dividing the audience into imaginary quadrants/grids of relatively smaller sizes and then making eye contact with the people in the corners of each section accomplishes the same audience rapport. Annan's central forehead is contracted (CFC) the entire time he's speaking (with the peripheral forehead relaxed). As long as there is no indication or trace or smile (which is very important to exclude - and displays a completely different and telling signal of dissonance - but it is NOT present here), then the CFC signals to us either emotion or physical pain - either directly experienced or felt indirectly via empathy. Kofi Annan's is displaying nonverbal his very sincere emotional pain for the deaths and suffering of the Syrian people. The former Secretary General would be well advised to use both hands (rather than just his right) - as "Illustrators" (also known by its colloquial, hand "gestures"). Illustrating with both hands properly, transmits greater levels of sincerity and engagement, while also building rapport and audience recall.